No Planet X: WISE observations rule out distant giant planet. 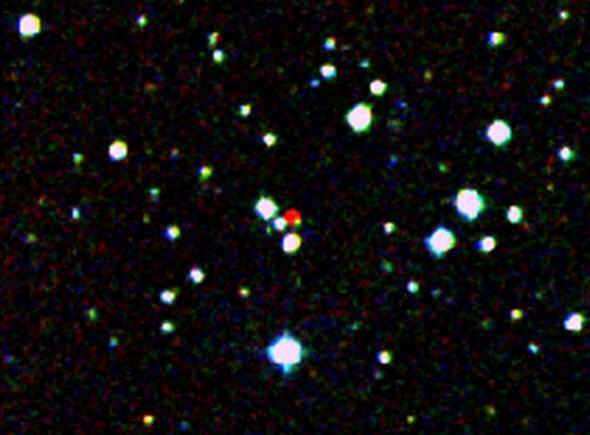 Not Planet X: This is actually a nearby very cool and red star discovered by WISE, seen here by the Digitized Sky Survey 2. Well, that’s that then. There are no other big planets in our solar system, no other giant planets orbiting the Sun in the distant, cold reaches well past Neptune. This news comes from a paper analyzing observations by WISE, the Wide-field Infrared Survey Explorer, a scrappy little mission that spent 13 months mapping the entire sky in infrared wavelengths. This is where warm objects are bright, things like dinky stars, asteroids, galactic dust, and more. WISE was very sensitive and was able to see objects that were pretty faint. For example, it found tens of thousands of previously undiscovered asteroids, some of which get pretty near the Earth. These glow in the infrared, heated by the Sun. What it didn’t discover, though, was another giant planet in our solar system. And it’s pretty definitive: It would’ve seen a planet the size of Saturn out to a distance of 1.5 trillion kilometers, more than a tenth of a light year! A planet the size of Jupiter would’ve been seen out to twice that far. We know this because planets that big are warm due to their internal heat, much of which is leftover from their formation 4.6 billion years ago, and which has been slowly leaking out ever since. This heat would make a planet stand out like a beacon in the WISE data; it would glow brightly in the far infrared. No such object was found. I’ll note that the limits on a smaller planet are a bit more open. A planet like Earth would cool far faster than a giant, and be difficult to detect if it were, say, 50 billion kilometers out or more. It would be an ice ball, most likely, but it’s not entirely out of the question. But a planet much bigger than Earth is pretty much ruled out for quite some distance. I’ll admit it: I’m disappointed. A while back, when I was working on Hubble and only a few exoplanets had yet been found, I was part of a project looking at young stars that were still coalescing from gas and dust (like the lovely HD 100546). We had pretty good evidence that one of these stars had a planet orbiting it at a distance of about 30 billion kilometers, 10 times the distance Neptune is from the Sun. That got us thinking: What if there were a planet like that orbiting our own star? Another giant planet circling our Sun? Theoretically, it’s possible. A planet could form closer to the Sun and then get flung out to a great distance by a gravitational interaction with another planet like Neptune. Another astronomer and I pursued the idea for a while, but at the time it would’ve been a huge pain to continue pursuing it; the search required a major software retooling of existing surveys, which would have been expensive for an unlikely payoff. We wound up dropping the idea after a while. Other researchers had looked into it as well. There was some rather scant evidence that comet orbits were showing an imprint of a gravitational encounter with a planet in the outer reaches of the solar system, though I found that argument unconvincing. Clearly, though, the idea has some romance to it! Also not Planet X. Or is it …? 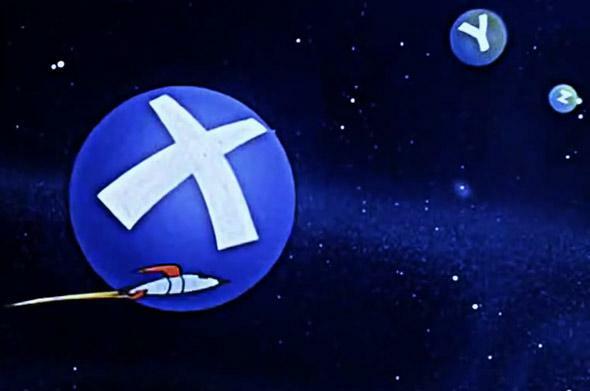 Photo by Warner Bros., from Duck Dodgers in the 24½th Century. I love that cartoon. Of course, sometimes it had too much romance. The existence of a Planet X has been at the heart of many crackpots as well, who claimed it was out there, possibly inhabited, and on a 3,600-year orbit that brought it into the inner solar system to deliver literally Biblical catastrophes upon our hapless world. Back in 2003 there was even a cult making this claim that got some notoriety … though it withered once the May 15, 2003, deadline for Planet X came and went without even a whimper, end-of-the-Earth-wise. As I predicted, though, the idea of Planet X, also called Nibiru, was resurrected for the Mayan Notpocalypse™, the claim that the Earth would be destroyed by some unspecified astronomical event on Dec. 21, 2012. Remember that? The time the Earth was not destroyed by some unspecified astronomical event? You’d think that eventually doomsday profits prophets would learn not to put themselves on a deadline. Now let’s be clear here: While the WISE results look pretty definitive, this will not stop the doom-criers. Central to their theories was the idea that NASA was lying about evidence of another planet. Given that WISE is a NASA mission, you can guess how much weight this will have with them. Remember, too, these folks claimed they saw Planet X in every Sun glint, in every picture, around every corner, and under every sofa cushion. Real scientific evidence was ignored, misinterpreted, or claimed to be faked. So this changes little with them. To heck with them anyway. What we have here is real, if disappointing, science. I’d love for there to be another planet in our solar system. How amazing, how exciting, how truly wonderful that would be! But the thing about reality is, it’s real, and we must accept it for what it is. In this case, it means we have to be satisfied with just the hundreds of moons, millions of asteroids, billions of comets, single star, and eight or nine major planets our solar system has now.